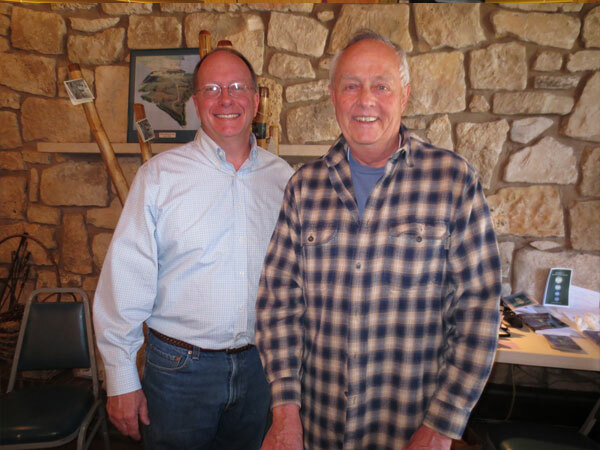 Greg Meyerhoff and Jack Stucki at Council Grove Conference, April 2013. Jack Stucki is a pioneer in subtle energy research. In 1967 he began his professional career as a music therapist. Soon he established a healing clinic and later he taught a course on integrative medicine at the University of Colorado Medical School. For three terms, he was the Pesident of the Colorado Association for Applied Psychophysiology and Biofeedback. He has been featured in several books including Life Force, the Scientific Basis by Claude Swanson, PhD, Radiant Minds edited by Jean Millay, PhD, and Healing Stories by Robert Alcorn, MD. His work with the comatose has been featured on educational television. Jack’s focus has always been on understanding the non-physical fields of the human body to resolve health issues. He enjoys finding new technologies for connecting with other worldly energies. And he practices his intuition everyday in a playful way to guess which socks are his versus his wife, Judy’s. I, Anne Salisbury, first met Jack back in 1995 with the intention of hiring him to teach a biofeedback class for our hypnosis school, the Transpersonal Hypnotherapy Institute. Our schedules didn’t mesh at the time, so now I am thrilled that we have reconnected and have begun to play together with our intuition. Anne Salisbury experiences Jack Stucki’s healing music chair. 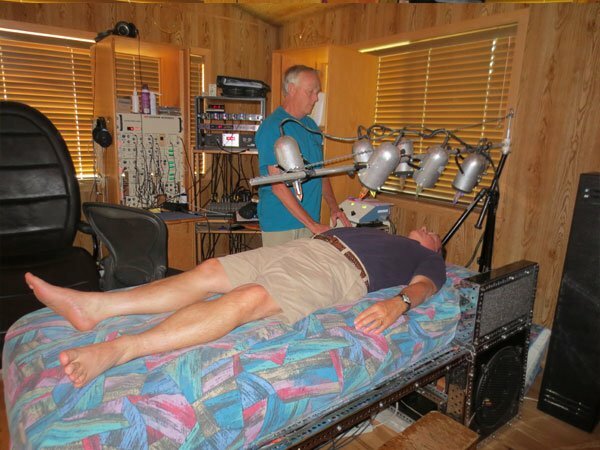 With biofeedback, hypnotherapy, music and a valuable vogal crystal (a mathematically cut crystal that has amazing healing capabilities), Jack assists clients in their healing. He supplements these modalities with technologies that reveal images of spirits from the other side, as well as past life images, that bleed through to this side of the veil. Seeing these images motivates you to clean up your unseen energy space! Why do I have pains that the doctor can’t understand? Why do I feel the presence of someone around me who has passed? Is another dimension affecting me without my knowing it? I feel sabotaged. How do energies and loved ones, past and present, affect me? Through using his intuition to research outside of the box, Jack has discovered ways to prove there are unseen energies and other dimensions that do, indeed, affect us daily. He has been able to photograph spirits and energies from beyond the veil using his “Bio-luminator” machine. With this he is able to alter the energy of the room, thereby creating an opening, or bleed-through from another dimension, that allows him to photograph otherwise unseen energies. By photographing the energies, or beings, that are surrounding and affecting his clients, Jack is able to give them an image that shows them the importance of clearing the issues. By physically seeing how other worldly energies are affecting their health, he helps his clients release what has caused their physical and emotional problems. Seeing helps people believe. Look at this dramatic photo! There is a heart transplant patient who has the donor’s face covering her own. In another photo, you could see the deceased husband and three children who died in a car crash surrounding the single survivor. And in yet another photo, you could see the face of an Indian woman from a past life overlaid on top of the client’s face. This client had persistent unexplained back pain that had never shown up in conventional medical scans. By using the tool of hypnotherapy, his client was able to experience how the Indian women had died – she was struck in the back with a spear. Because this woman held such deep regret around deserting her child at her death, she carried the back pain of the past into this life. When she saw the past life incident, she gained a larger perspective and forgave herself for leaving her child. The pain disappeared. No more treatments were necessary. After photographing his clients to show images of issues that are causing ill health, Jack uses his sound and light devices to clear the energies. When Greg and I we were at Jack and Judy’s place south of Colorado Springs, Colorado, we experienced both his music chair and his light bed. During this process, Greg intuitively (clairvoyantly) saw the overlaid image of a mummy moving out of my body, similar to the overlaid images seen in Jack’s photographs. Prior to this, I hadn’t told anyone how compelled I felt around being organized for my death in this life. I was unsure from where these thoughts were coming but assumed they were from some Egyptian past life. So this healing session with Jack was significant. I now feel much freer to simply enjoy life and not have to prepare so much for my own passing. And while Greg was on the healing bed that Jack designed, in which light is directed through crystals to each chakra, I clairvoyantly watched white goo come out of every cell in Greg’s body creating a cloud of white dust around him. In asking Jack about this, he said that he designed his bed to do that. It is meant to help the spirit release the gooey attachment to images, or issues, in this world. So, after we got home, Greg and I gave each other Transpersonal Hypnotherapy sessions to clear more of our issues and integrate the healing we had done with Jack. We feel more whole now and are extremely grateful to Jack Stucki for his innovative work in healing. Reach Jack at 719-485-3789 or stucki@socolo.net. He does not have a website. Find Mark Macy, who works with Jack and uses short wave radios to hear voices from the other side, at www.SpiritFaces.com. Read Bridges 2013 Article by Jack Stucki and Celia Coates: Awakening and the Great Invocation. They wrote this for Bridges, the ISSSEEM magazine. It includes an updating of “The Great Invocation” that was originally written by Alice Baily.